Jim Bullard's paper from last week was widely covered in the blogosphere and in the mainstream press. Jim attempts to use available economic theory to justify further monetary "easing" through the purchases of long-maturity Treasuries. As I argued in my previous piece on Bullard's work, Jim's argument failed to convince me either that inflation was an impending peril or, if it were an impending peril, that further purchases of long-maturity Treasuries (or mortgage-backed securities for that matter) would accomplish the intended goal of increasing inflation. Bullard at least attempts to use received macroeconomic theory to make his arguments, which is more than I can say for Krugman (see this). Krugman, apparently under some pressure from his readers, comes up with some arguments for why deflation is bad. These are essentially: (i) at the zero lower bound on the nominal interest rate, deflation makes the real interest rate "too high," and people will not want to borrow and spend; (ii) unanticipated deflation redistributes income from borrowers to lenders; and (iii) nominal wage rigidity implies that, with deflation, the real wage rises, and unemployment grows. On (i): I think what Krugman is trying to say is that, given the high anticipated rate of return on cash when there is an anticipated deflation, people would rather hold money as an asset than alternative assets - loans for example. The problem is that this cannot continue indefinitely. In real terms, the quantity of cash ultimately gets very large, and people will eventually want to spend it. A long-run deflation cannot be supported without the money stock declining on trend - and we know that is not happening. On (ii): This is certainly true. But why is a reduction of the inflation rate from, say, 2% per annum to -0.5% per annum a big deal? The large disinflation we had in the 1980s certainly does not seem to have been a disaster. On (iii): Anyone who thinks that wage rigidity (or price rigidity) is important to any current macroeconomic phenomena in the United States should provide some serious evidence. The serious evidence cannot be: "I see a large quantity of unemployed people, and in Econ 101 I was taught that people are only unemployed due to nominal wage rigidity." As I mentioned above, Bullard at least tries to use received theory to think about this. Some serious macroeconomic researchers have written down models with multiple equilibria, and there is the possibility that, in these models, we can converge to a deflationary steady state. These results were vetted by serious editors and serious referees, and published in serious economics journals. Bullard thinks the results have something to do with our current predicament, and draws some policy conclusions. I think he is blowing hot air. Krugman is also blowing hot air, but in a different way. Whatever deflationary "trap" he is thinking about makes no economic sense to me - I can't see how to write down the model that produces this. It is certainly clear that the inflation rate is low, by any measure. The most broad measure, the implicit GDP price deflator, grew 0.8% between 2009Q2 and 2010Q2. But of course what matters for economic policy, particularly for the FOMC meeting next week, is future inflation. What can we say about that? One measure of anticipated future inflation is the difference in yields between nominal Treasury bonds and TIPS (inflation-indexed Treasury bonds) of the same maturity. The first chart shows the difference in yields between nominal 10-year Treasuries and 10-year tips. This yield differential is not literally the anticipated inflation rate over a 10-year horizon. We have to worry about effects due to inflation risk premia, and the fact that the zero lower bound on inflation-contingent TIPS coupon payments biases the measure up. However, this is the best we can do in terms of a market measure of anticipated inflation, and we can at least attach some significance to movements in the measure. Note that the yield margin has dropped recently below 2%, though the drop has not been large. Further, the most recent observation (Friday, August 6) was 1.92, which is up from the last observation in the chart, which is the average for July. I don't see anything here that tells me financial markets are expecting a prolonged deflation - and these are people that have to put their money where their mouth is. 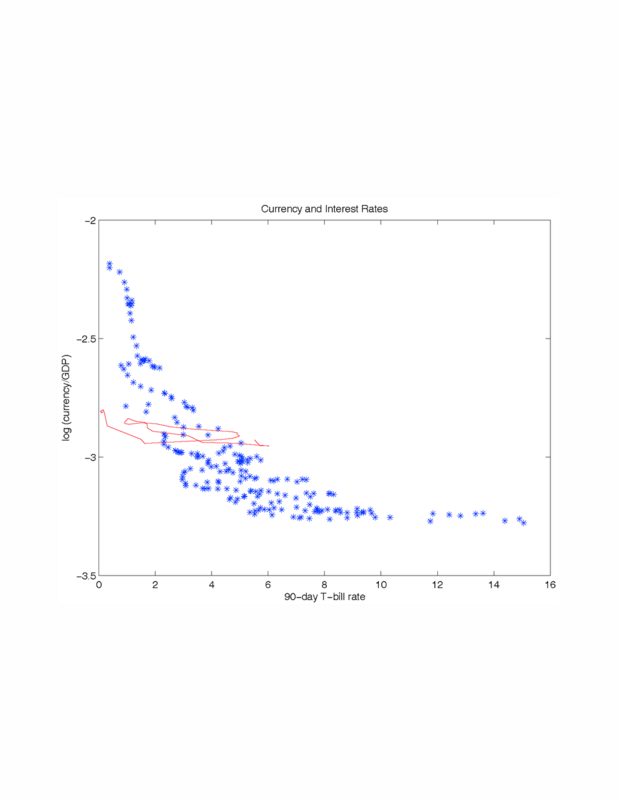 What does standard macroeconomics tell us about inflation forecasting? New Keynesians, and Krugmaniacs, typically think in Phillips-curve terms. There is a very large output gap, so we should expect inflation to be very low. There is strong empirical evidence, however, (here) that Phillips-curve constructs are useless for forecasting inflation, and the recent data is entirely consistent with that evidence. How would a New Monetarist think about the causes of inflation? The price level is the inverse of the price of outside money in terms of goods and services. The component of outside money that is actually exchanged for goods and services is currency. Thus, what determines the price level is the demand and supply of currency. Of course this may not be very helpful if I want to forecast inflation. 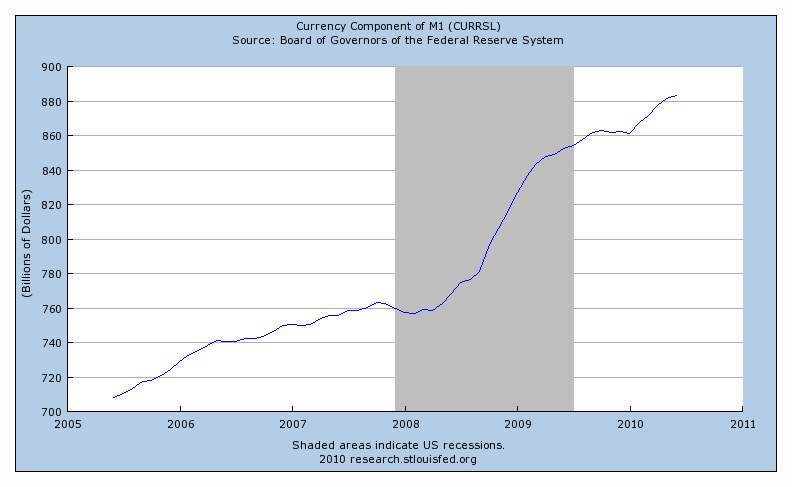 As is well-known, a large fraction of the stock of US currency (half?) is held outside of the United States. Also, inside and outside the US, currency is widely used as a medium of exchange in various illegal transactions. Thus, we know at the outset that some important factors that determine the demand for currency are going to be difficult or impossible to measure. However, let's take a stab at this anyway. The first chart shows the stock of currency (the currency component of M1) relative to nominal GDP for the period 1947Q1 to 2010Q2. Now, if anyone thinks that currency is somehow going away (based on their own use of the stuff), this chart should disabuse them of that notion. Currency is still important, not only because it is financing essentially all of the central bank's portfolio in normal times, but because there is a lot of it in circulation. 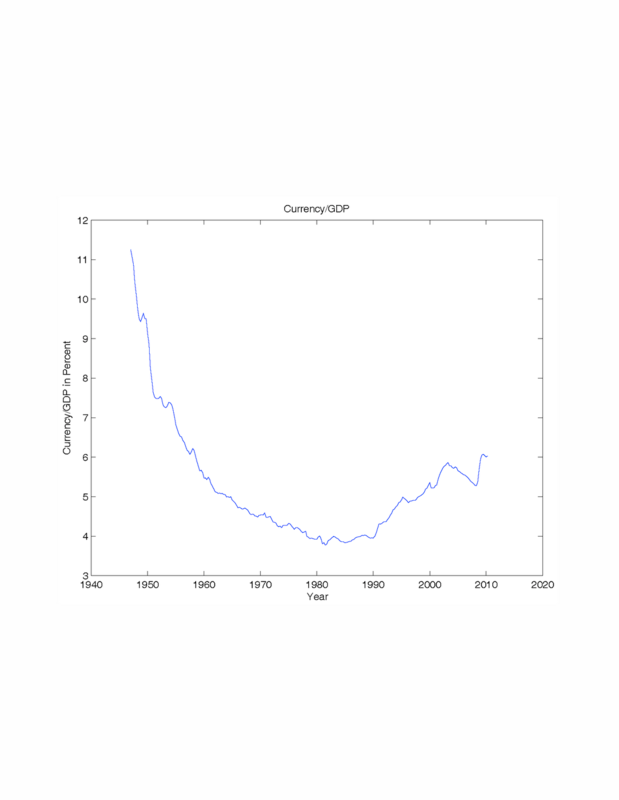 The quantity of currency bottomed out in about 1980 at 4% of GDP, but it currently sits at about 6%. 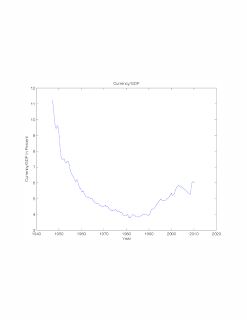 That is, the quantity of US currency in circulation in the world at any point in time is 6% of annual US GDP. Now, what if I conduct a standard Old Monetarist exercise, which is to plot the log of the ratio of currency to nominal GDP against the nominal interest rate (the 3-month T-bill rate)? This is in the next chart. Observations from 2000Q1 to 2010Q2 are shown in red, tracking from right to left (with a loop). This doesn't look bad, in terms of "money demand" observations, and the recent data does not look anomalous, i.e. there does not appear to have been a large increase in the demand for currency associated with the financial crisis, which would have tended to drive down the price level. Next, what has been happening to the nominal stock of currency recently? For this, see the next chart. The currency stock has been growing at a reasonable pace - indeed a pace that is entirely consistent with the inflation we have been seeing, given the short-run fluctuations in currency demand that we are typically prone to. 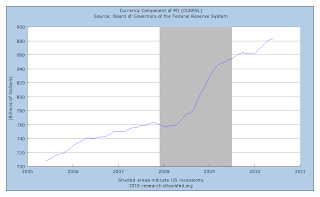 Further, since 2008Q1, the currency stock has been growing at an average annual rate of about 6.4%. There is nothing here that would make us anticipate deflation. Since you argue for quantity theory of money here how does your theory explain Japan and what makes you think that USA is not Japan? Secondly, velocity in QTM is unknown unknown. However one can argue that velocity of money for rich is much lower than velocity of money for poor simply because rich do not spend all their income and more. It is now a clear fact that distribution of wealth goes predominantly towards rich. How do you reconcile it with your theory? What makes you think the USA is Japan? Actually it is a question to you. Why do not think US is not Japan. "The problem is that this cannot continue indefinitely. In real terms, the quantity of cash ultimately gets very large, and people will eventually want to spend it." Cannot continue indefinitely is not very comforting. This is a terrible argument. The depression will not last indefinitely. We will only have horrible suffering and tragedy for a few decades, that we could have made a fraction as long or as bad. Why do you want to make suffering and loss last a lot longer than it has to just because it won't last indefinitely? Because if you let the free market do the adjusting it might take a lot longer but will be a lot more efficient adjustment? Sorry, the pure free market allocates far more inefficiently than if you have a substantial government role added to the market due to externalities, especially ginormous positional/context/prestige externalities, the zero marginal cost of idea/info utilization, asymmetric information, etc., etc. "The large disinflation we had in the 1980s certainly does not seem to have been a disaster." It was accompanied by the worst recession since the depression up to that time. Plus, there was a lot less consumer debt at that time due to much more consumer regualtion and protection. 1. You seem to think we'll get less suffering (i.e. more people employed) if we can somehow engineer more inflation. What makes you think that? 2. Yes, the consensus seems to be that the early 80s recession was caused by the disinflation engineered by the Fed. Paul Volcker understood that he was going to cause some suffering in the short term (and the recession was much shorter and less painful than some thought it would be), but he seemed to think the long-term benefits of the disinflation were worth it. The risk we are currently facing is more inflation than some people seem to be expecting, and having to go through that again, on top of what we have already been through. There is at least strong evidence that substantial downward nominal wage rigidity exists in the United States. The macroeconomics text by Dornbusch, Fischer, and Startz (2008, 10th ed.) 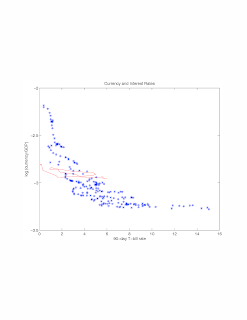 refers (on page 130) to a working paper by Joseph G. Altonji of Yale, and Paul J. Devereux of British Columbia, "The Extent and Consequences of Downward Nominal Wage Rigidity" (1999). It was published as a book chapter in 2000. Using the Panel Study of Income Dynamics, we find that true wage changes have many fewer nominal cuts and more nominal freezes than reported nominal wage changes. The data overwhelmingly rejects a model of flexible wage changes and provides some evidence against a model of perfect downward rigidity in favor of a more general model. The more general model incorporates downward rigidity but specifies that nominal wage cuts may occur when large cuts would occur in the absence of wage rigidity. However, the results of the general model imply that nominal wage cuts are rare. We also analyze the personnel files of a large corporation and find cuts in base pay are rare and almost always associated with changes in full time status or a switch between compensation schemes involving incentives. Our evidence on the consequences of nominal wage rigidity is mixed. That was in reference to your (iii). I'll try to answer your question soon. But if nominal wage rigidity is such a big problem, how did we go from about 15% inflation to 5% from 1980-83 and not have 10 years or more of depressed growth? Forgot to mention: There was a story in the NYT last week (Friday I think). Purely anecdotal, but it was all about people taking wage cuts - public and private sectors. Ok though I asked first. Inflation is falling. FED is clueless. People in Japan save because they can now be fired (thanks neoliberalism), have no public pension, social security, etc. National bestsellers have titles like how to survive on 30k per year in Tokyo and 20k per year outside of Tokyo. Exactly the direction US is going. Any stock of money is useless until people start spending. People do not spend. They have no income to spend and no job to earn this income. The only force which spends fiercely is government but wait until "consolidation" non-sense hits full force. This is no rational maximizing outcome. Actually it has never been so since any outcome under noeliberalism is fully skewed towards capital. Because labour force is "inflationary". No, I don't think there is much similarity to Japan in the 1990s at all. In any event, what ailed (or still ails) Japan has little to do with deflation. And what was (is) that? "But if nominal wage rigidity is such a big problem, how did we go from about 15% inflation to 5% from 1980-83 and not have 10 years or more of depressed growth? " Because wage levels are downward sticky, not wage growth. Игры рынка: this guy is a hopeless moron. "But if nominal wage rigidity is such a big problem, how did we go from about 15% inflation to 5% from 1980-83 and not have 10 years or more of depressed growth?" Krugman was talking about deflation, or extremely low inflation, not disinflation from very high inflation to a still substantial 5%. That's why he wrote in the post you link to, "it’s a fact of life that it’s very hard to cut nominal wages"; note the word nominal. If inflation drops from 15% to 5%, you're typically just getting workers to agree to a nominal pay raise of a substantial 5%, instead of 15%, not a nominal pay cut. This doesn't involve asking for nominal pay cuts except in rare situations where a worker's relative productive value drops by more than 5% in real terms. But if you have extremely low inflation, or deflation, then to keep employment markets in equilibrium will require nominal pay cuts that are common, not rare. In the case of deflation they will have to be the rule, not the very rare exception. period show nominal-wage cuts, while a substantial number (1142 or 10.4%) show a wage freeze; jointly both figures could be considered as strong evidence in favour of the presence of DNWR. and the remaining 4899 (or 44.8%) contracts showed both nominal and real-wage increase. "Because wage levels are downward sticky, not wage growth." This is an empirical fact? A law of nature? One of those things we "just know." When Volcker tightened in the early 80s, the arguments people made were exactly the same as this. One standard argument was to fit a Phillips curve to the data and estimate a "sacrifice ratio." Keynesians argued that the sacrifice was going to be huge, and argued for "gradualism" - i.e. bringing inflation down over a long period of time, basically because of wage rigidity. Wage rigidity is wage rigidity - forget about the levels, growth rates, and up and down. And this is for a disinflation from about 15% to 5%. Going from 2.5% to -7.5% would be much worse for the reason I stated earlier, resistance to nominal wage cuts, and that has tons of empirical evidence to support it; see especially the first paper I cited. Wages are not just cost but also income. What can work in case of one firm will fail on macro level. So you can cut macro-wages and macro-income and how will it affect your GDP? What will substitute lost income? ""Because wage levels are downward sticky, not wage growth." This is an empirical fact? A law of nature? One of those things we "just know."" It's the argument being made. Furthermore, there does appear to be some empirical evidence for it. You don't make yourself look good by so obviously misinterpreting such a simple argument. on (i): Sure, cannot continue indefinitely, and nobody claims it will, but for people here and now it will hurt. For how long? We don't know. (iii) There's a paper, IIRC, by Bewley, in EER, back when it was still a decent journal, where he went and surveyed businesses on the sources of downward wage rigidity. Lately I get reminded of that paper whenever someone is doing some hand-waving and trying to defend 'modern macro', by mentioning Mortensen-Pissarides multiple times and heterogeneity a few more times. In a nut-shell all that fancy matching is nice, but has nothing to do with downward rigidity. And most of labor market models fall into the same category. So yeah, having a model is important, but having a model that is inconsistent with basic evidence - is counter-productive. That way you end-up with some junk similar to Lee Ohanian's account of the Great Depression. If you're worried about zero bound on coupon payments in TIPS - use off-the-run TIPS, where some coupons have already been accumulated, if deflation happens those will be deducted back, thus you can gauge what that tells you. Of-course there's always an extra liquidity premium in off-the-run tips. And I'm gonna repeat once again: there's some evidence that Phillips curve is useful in forecasting when the output gap is large. (ii) No, it's not obvious at all. Friedman rule results where deflation is optimal are standard, but bad equilibria with deflation are not. The consumption-postponement argument has never made any sense to me. If everyone wants to postpone consumption because there is deflation, how can there be deflation in general equilibrium? I'm not sure what to make of this. We can certainly learn a lot by asking people how they do things. What financial instruments do investment bankers trade and how? What are banks up to? You can carry this too far though. Sometimes individual economic actors have little perspective on what they are actually up to. That's why we have economists. "In a nut-shell all that fancy matching is nice, but has nothing to do with downward rigidity." Exactly. The search and matching people think that downward rigidity is not where the action is. (except for the debate among Hall/Shimer/Hagedorn-Manovskii where Hall's side of the argument was that you could solve some empirical puzzles with rigidity) I would not call this work "hand-waving." It's more than 40 years of serious theory and quantitative work. "That's why we have economists." "It's more than 40 years of serious theory and quantitative work." Ouch. Please remind me how did we get into this crisis? Arrogance will never give it away. "why is a reduction of the inflation rate from, say, 2% per annum to -0.5% per annum a big deal?" It's the context (deleveraging) rather than the numbers - that's the argument. I would be very interested in hearing what you think ails Japan (supply side/low TFP? banking system?) and why you think QE didn't succeed there. I'm not trying to pick a fight, I'm genuinely interested in your views. "If everyone wants to postpone consumption because there is deflation, how can there be deflation in general equilibrium?" Why not? We'd expect an an increase in the real interest rate to reduce consumption and investment which means it increases the demand for money and bonds (and other financial assets). What difference does it make what made the real rate increase. You can't logically believe that it is possible for the demand for financial assets to increase but it's not possible for the demand for consumption/investment to decrease. Deflation increases the demand for money and bonds by making their real return higher, this is exactly the same thing as decreasing the demand for consumption and investment. "The first chart shows the difference in yields between nominal 10-year Treasuries and 10-year tip...I don't see anything here that tells me financial markets are expecting a prolonged deflation - and these are people that have to put their money where their mouth is." But Stephen, this is a measure of what investors think the Fed. will do about inflation over the next 10 years, NOT a measure of what investors think inflation will be if the Fed does nothing. The Fed. can get whatever approximate amount of inflation (or deflation) it wants over a period as long as 10 years. The TIPS implied inflation is NOT what investors anticipate inflation will be over the next 10 years IF the Fed does nothing. It's basically what investors think is the inflation level the Fed wants over the next 10 years, and how much action the Fed will take to get it. Furthermore, the biases you mentioned in this rate both go in the same direction; they overstate it. Today the 10-year fixed rate is 2.69% (Wow! ), and the yield on a TIPS expiring in July of 2020 is 0.934% plus the CPI. The difference is 1.76%, but that includes not just the projected 10 year inflation, but also a premium for the lock-in safety and the no deflation decrease guarantee. So the projected inflation implied there could easily be less than 1.5%. ^This is a surprisingly coherent post, the first such one Serlin has produced. He still seems to know nothing about macroeconomics. And that Russian guy is just plain crazy. "that Russian guy is just plain crazy"
" He still seems to know nothing about macroeconomics." "If everyone wants to postpone consumption because they want to increase their bond holdings, how can there be increased demand for bonds in general equilibrium?" "If everyone wants to postpone consumption because there are high return investments available, how can there be high return investments available in general equilibrium?" Is he suggesting it's impossible to have investment in general equilibrium? We don't live in an endowment economy, intertemporal substitution does appear to go on. "I think what Krugman is trying to say is that, given the high anticipated rate of return on cash when there is an anticipated deflation, people would rather hold money as an asset than alternative assets - loans for example." That's not the point, as an asset people are happy to hold a loan since deflation increases the real return to all nominal assets equally. It's real investment goods that people are less willing to hold. Furthermore, deflation increases the real rate that the borrower faces, thus the willingness to borrow is reduced, not the willingness to lend. That statement is always true of deflation so yes, it can't continue forever but there have been enough examples to show that it can continue for a very long time.